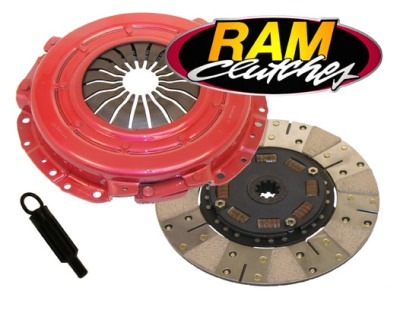 * Includes alignment tool Ram Powergrip HD clutch sets are the ultimate for extreme street/strip performance. Using their proprietary 900 Series friction material in conjunction with increased clamp load pressure plates, you get maximum holding power for the track or street, with minimal reduction in drivability. These are the clutch sets for big power street cars! Some clutch chatter will occur on takeoff. The Ram Powergrip HD clutch sets are designed for use with RAM billet steel or factory nodular iron (explosion-resistant) flywheels. Our Quality & Finish will leave you with a grin from ear to ear as it is the Best looking unit available for your Ford Mustang or Cobra. Quality Construction: No one else gives you the bold clean styling of our Aftermarket Dress Ups, Suspension and Performance Parts for your American Muscle Car like UPR Products! Click Here for Instructions Fits these Vehicles: 2005 2006 2007 2008 2009 2010 4.6L 3V V8 LX GTS GT Mustang Roush & Saleen Vehicles. Made in the USA!